There's been quite a few discussions about whether characters will be retiring in RoW or moving on to our new site. Many of our beloved characters will be staying, which opens up lots of opportunities for new characters. With breeding season coming up very soon, I know there's a lot of ambiguity around how that is going to work. Sarah and I have discussed a few possibilities, but I mostly wanted to open it up to discussion to see what the community would prefer. Alternatively, we could open up the new board once we establish the new setting while we continue to work on some of the extra features & functionalities that are nice to have, but not necessarily required to get started. Maybe this isn't really a problem and isn't worth worrying about. Having less breeding couples initially might not be the worst thing. I'm honestly not sure! Would love to hear others' thoughts on this! I'm totally open to all these possibilities! I've never been around for a breeding season, but I have lurked. Personally, I think having less breeding pairs might be beneficial. It seems like last season a lot of pups were created, maybe too many pups. It is sad to see a lot of those characters inactive now or not developed, but it happens. I think it might be best to have less puppies. Breeding season is exciting though, and might be what everyone needs to start things off right! It's a great opportunity to refresh muse and build new characters. Either way, it doesn't impact me too much. I love the idea of opening the board a bit earlier, or extending breeding season. Overall though, I don't think it is worth worrying about. I think we could probably just proceed as normal, and have breeding season in March. Maybe as a precaution we could ease up on some of the rules for breeding so that there are puppies, but really emphasize that potential parents should think about whether they want to take on the responsibility of playing a parent, or whether they want to dedicate the time it takes to thread with their future cub's players before breeding. My thing about puppies, or more specifically, the amount of puppies is that it doesn't really matter. Whether the puppies find players or not, whether they make it to adulthood or not. Realistically, every cub doesn't make it out of the den, and even less make it to adulthood, so I don't think that it's really that big of a deal. When people drop characters to play puppies, they probably weren't so invested in those characters to begin with, so it's kind of good in the way that it filters out those muse-draining characters. Those who don't plan on bringing their characters over just won't breed, or will breed, but not put their puppies up for adoption. (In case any of the players with wolves staying behind might want to bring their children in in a couple of months.) And those who want to start threading now could probably just bring their new characters into RL in a 'just passing through' type fashion now to start making ~connections~. My real fear with that last point is that people might try to force relationships in lieu of breeding season, which could make things... messy, but I mean.. character development? The real problem with the timing is making sure that the new site is launched before the birthing happens, because once those ladies start poppin' they're stuck for several weeks/months. I really want to put a big.. disclaimer type thing here. I don't want you guys to have to rush through this, and have you just.. settle on things to get the new site knocked out. Even like names of places, I don't want you to have to be like, 'Oh we need one more name. Let's just call it woodsy meadow, because the ladies are going to start birthin' if we don't hurry it up.' I want you to be able to take the time to really make a site you like, and that you're happy with, so if we have to push the season back to April, I'm for it. I'd be afraid of the whole setting up a new board here on RoW, because I feel like things could get really convoluted/confusing without a map/places/general descriptions/coordinates. All of those things really help with muse/world building, and I would hate for people to lose muse for their new characters before the new site even gets a chance. It might be prudent to wait until we actually have those things, and then I'm game for either setting up a forum here, or moving to the new site sans extra features. A functioning w.i.p. doesn't sound too bad to me. I think that in itself might help. But having those other options seems pretty good just depending what everyone else wants/thinks? 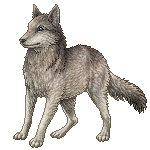 Characters that ARE planning to move, regardless of pack status, could have 2-3 pups? I still worry about having too many puppies in any one breeding season, but that's mainly because of how many usually end up active at the end of the year. I vote for breeding season being between March-April and therefore birthing season May-June. I do pretty much agree with everything Pinn has said. I think it's more important to take the time and care towards the new site and shouldn't think breeding season should get in the way of that. If people transfer their charries, they can just develop the relations in this board for the pups and if they make new charries, I don't think alot of people will have a brand new charrie pop out babies right away anyhow. Just a bit curious of how things are gonna work (re: breeding season) at this point in time. Should characters be in heat/breeding now if they are in the Lore still? I'm not really sure if the window has been missed to start puppy plots in the Lore or how the season is being lined up this year with the site move. What if packs have a certain number of slots for puppies and its up to leaders how they distribute them? I know traditionally it has just been "you can't have more pups than adults" in a pack but maybe if we give it a concrete number that'll help out with some puppy number balances that people seem to point out? Example: Leader A & B want puppies so they get to used their pack puppy slots first for however they want. Any possible left over slots could be up to the leaders to deal out or not.